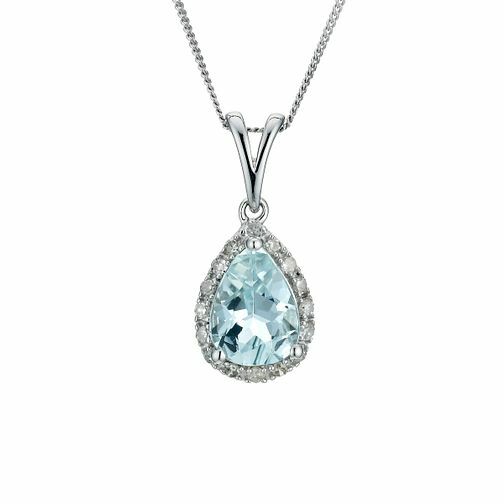 9ct white gold pear shape aquamarine and diamond edged pendant. A shimmering blue pendant that catches the light beautifully. 9ct white gold aquamarine pendant is rated 3.7 out of 5 by 7. Rated 4 out of 5 by Anonymous from Lovely pendant This is a beautiful pendant, I bought one for my fiancée to wear on our wedding day. She loves it - the only thing we'd change is to have a slightly thicker (stronger) chain. It's easily twisted/knotted and is rather difficult to straighten out. Rated 4 out of 5 by Anonymous from Beautiful and delicate Beautiful peace of jewellery and extra special as the stone is birth month stone. Just really tiny and the chain is so fine. From the picture I expected it to be a little larger. It was for a present and the recipient loved it though.